Posted by admin in volcanoes. The Chilean newspaper El Mercurio has published a series of dramatic high-definition aerial photographs of the devastation caused along Chile’s coast by the tsunami associated with the 27 February 2010 earthquake. 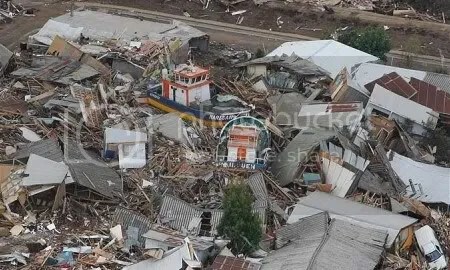 It looks like practically all of these pictures are tsunami damage. It’s probably a lot better where they didn’t have to deal with waves, too. Not to say that there won’t be plenty of damage, but I suspect these pictures were cherry-picked by sensationalist journalists. Despite the word ‘terremoto’ in the title, the El Mercurio gallery does indeed overwhelmingly show tsunami damage. That’s why I headed this post ‘Chile tsunami’ rather than ‘Chile earthquake’. Well of course the pictures are ‘cherry picked’. Wouldn’t be much point in showing ‘dramatic high-definition aerial photographs of everything looking much like it did before’, would there? Something entirely different here – there is something serious happening under Iceland’s Eyjafjallajökull, a small, glacier-covered volcano immedately to the west of Katla volcano. I don’t know enough Icelandic to understand what the following newspaper bit says, but it contains words like “gosið”, which means “volcanic eruption”, not referring only to the most recent eruption of this volcano, in 1821-1823. Thanks for the tip, Boris. I’ll bump this up into a post shortly. I don’t think the photos are cherry-picked, beause the damage in many places were from the coastline to a few kilometers inland. I agree, Guillermo. The damage in Chile is real enough. I don’t see that there’s any need to be snarky about pictures of it. Matt is the reason politicians get away with murder. He simply doesn’t WANT to hear bad news. “It’s the media”. No, Matt, the media REPORTS it. It doesn’t DO it.